“Duchamp’s use of objects is similar to the way I might incorporate different painting languages. He’s not just quoting a urinal when he changes it to an art object. The urinal comes loaded with its own set of cultural, psychological, and functional meanings which Duchamp exploits, but with the new context he provides, generates further meanings. It certainly seems to go beyond quotation. Similarly, I use fragments from Disney, high art, mail-order catalogues, or whatever as visual stimuli which I bring forward into a new context. It’s this process of upheaval, from old to new, that gives new meanings. This is use, or usage, as distinct from quotation. It may be more enlightening to imagine painting as a fluent language with new words and new uses of words engendered all the time. It’s not necessarily quoting to imbue familiar phrases with new meanings. Each mark or shape I use has a part to play in the painting as a whole, which outstrips its possible role as a quote.” Fiona Rae in conversation with Shirley Kaneda, October 1, 1994. Fiona Rae paintings feel like stealth Mannerism. They sneak up on you. So many Modern Era techniques, styles, ideas and images all floating through a loose Postmodern Landscape. There’s never a ground, never a solid foundation where the Modernism she appropriates can rest. Every image, every stroke is morphing into the next thing. And in typical Postmodern fashion if you try to pull the meanings together or if you try to look for an emotional experience you’ll lose the thread. Instead you just have to look, to follow the movement, take note and watch the show unfold before your eyes. “The paintings of Fiona Rae lay out on canvas the chief contradictions and polemics of the post-modern condition of painting. The dynamic push and pull of Rae’s work, its assured hesitancy, its rehearsed spontaneity suggest an oxymoronic tension at the core. Rae has sometimes been described as a cynical appropriationist who, having digested post-modern theory on the death of the author, has constructed her painting as an illustration of the impossibility of unmediated, pure expression. The anxiety that this interpretation reveals may derive in part from the fact that the suggested sources do not have their origin in the mediated or constructed images of advertising or photography, but in the painterly productions of great twentieth-century painters: Picasso, Matisse, Guston, Picabia, to name a few. High art is not being taken seriously. But no one has been offended or enraged by Rae’s other image banks: Krazy Kat, Little Nemo, Tintin or Fruit Crate Art. 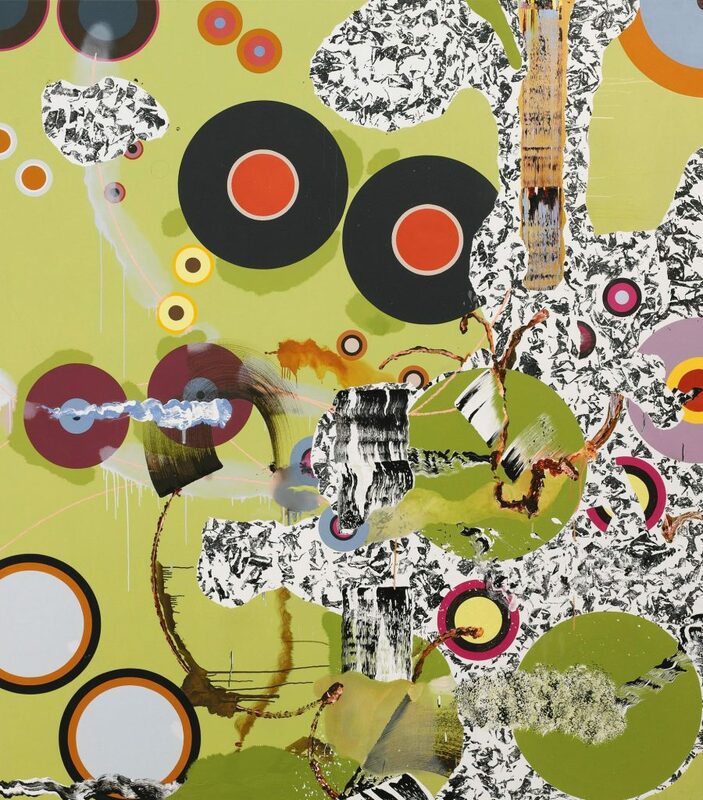 The forces demanding that painting remain the last bastion of the expression of the human soul see nothing but emptiness in Rae’s work, because she has dared to question the notion of originality.” Emma Dexter on Fiona Rae, 1994.